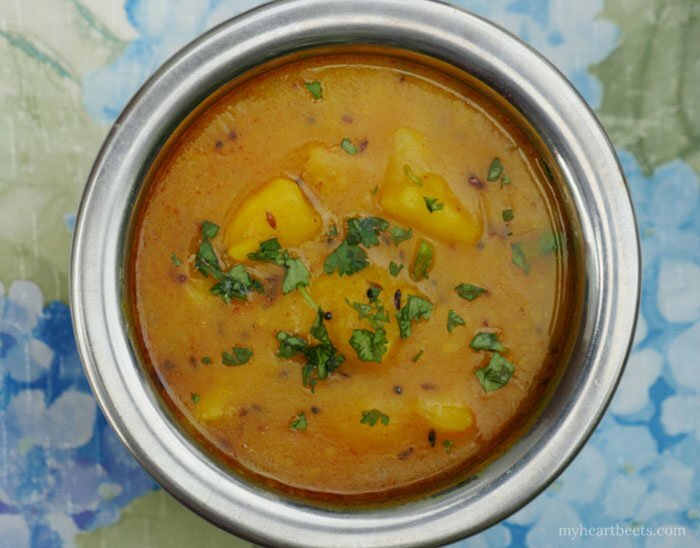 Aloo curry is the Indian version of a rustic potato soup. It’s a very simple recipe that calls for just a handful of ingredients and it takes no time at all to make. 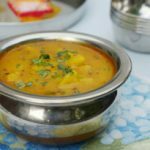 I grew up eating this very mild curry as a child and so for me, this is comfort food. While I realize that potatoes are not weight-loss friendly, I do consider them a real food. They’re not for everyone and so, if they don’t agree with you, then try one of my other tasty soup recipes. But if you can tolerate potatoes, then try this as a starter to a meal, or as a side dish. 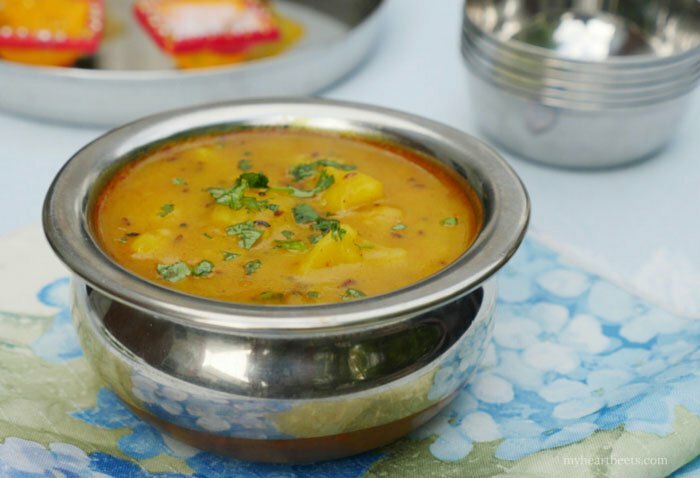 This north Indian potato curry is typically eaten with fried puris (or pooris). While I have yet to recreate that fried flatbread, I happen to think that this curry tastes just as good with my paleo naan. 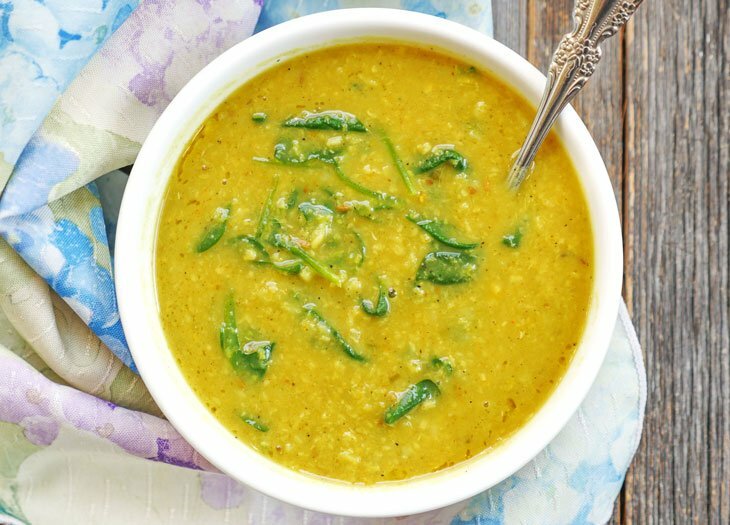 There’s just something about this thick yet soupy curry that begs to be scooped up. Boil Potatoes: Place well-scrubbed potatoes in a large pot and add cold water so that it is an inch above the potatoes. Cover and bring to a boil, then lower the heat to medium. Test for doneness at 30 minutes. A sharp knife should easily go through the potato. Once potatoes are cool enough to handle, remove the peel and break them apart using your hands. In a medium sized pot, heat avocado oil over medium heat. Once the oil is hot, add cumin seeds and mustard seeds. When the cumin and mustard seeds begin to splutter, add the paprika/kashmiri chili powder, turmeric, salt and cayenne. Add the cooked potatoes and stir them in the pot to make sure they are well coated with the spices. Next, add the water and raise the heat to high to bring the potato curry to a boil, then reduce the heat to medium and simmer for 5 minutes. This soup was pretty bland. Part of the problem could be the measurement, 4 medium potatoes is subjective so I might have had too much potato. yeah that was probably the issue. I’ll try to weigh the potatoes the next time I make this. 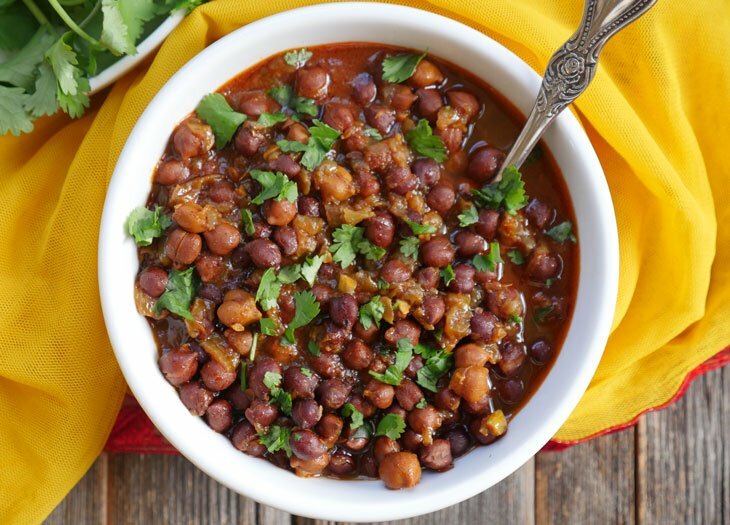 This is super easy and has good flavor. The first time I made it I made two separate batches, one with water and one with chicken broth. Turns out the one with water was the best. Great soup to feed a crowd and for cold winter nights. Leftovers taste even better as the flavors meld together. Thank you for a quick, easy, low-cost recipe for my fall and winter repertoire. Deanna, thank you 🙂 Happy to hear that you like this recipe! Potatoes are not fattening. It’s the junk most people put on them (butter, cream, sour cream, cheese, etc) that’s fattening. With a whole foods plant-based way of eating, potatoes in their whole form are very healthy and can be eaten ad libitum.